Eddington’s experience with student teaching is not an uncommon one; many student teachers have to face realities of teaching that they did not realize existed before. The challenges are different for all teachers, but the reality is always the same—being a new teacher isn’t easy. However, early teaching experiences and mentoring can help foster good habits even though it is difficult. Her student mentoring helped her instill good techniques such as self-evaluations and adjust to teaching full-time with her own classroom. Her mentor was a crucial part of the learning process thanks to the daily feedback she received. 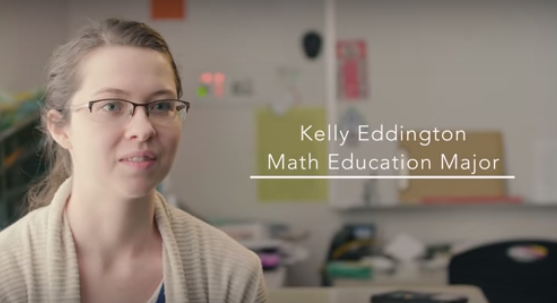 Eddington’s self-reflections helped improve her teaching and gave her confidence to tackle new challenges in new circumstance such as her current job at Bear River High School. Eddington realized that she learned a lot from both her education at BYU and her student teaching. She offered the following advice for young teachers like herself and those still pursuing their degrees. Avoid focusing on too many things at once. Pick one thing and work on it. High level learning is possible for everyone and that math can be understood by everyone. Try to teach as much as you can as early as you can. Request access to our closed group. We update our members on upcoming events, seminars and career opportunities.